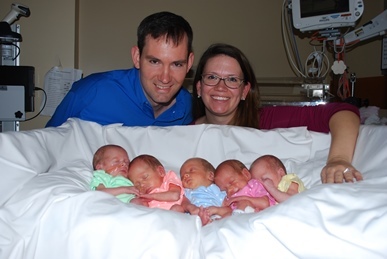 St. Joseph's celebrated a miraculous milestone just in time for Christmas with the birth of the hospital's first set of quintuplets, welcomed by parents Margaret and Michael Baudinet, Dec. 4, 2016. To honor the occasion, Santa held a press conference during a brief layover in Phoenix, taking time to greet each of the infants—Ava, Clara, Camille, Isabelle and Luke—and congratulate both the parents and the entire team at St. Joseph's Nursery Intensive Care Unit (NyICU). Santa also offered sleigh-services to transport the family safely to their home in Virginia, as soon as the babies were released from the hospital. The couple decided to relocate temporarily to Phoenix several months ago to receive care at St. Joseph's Hospital—after evaluating doctors and hospitals nationwide for experience treating high-risk pregnancies and multiple births. While complications can happen with any pregnancy, Margaret’s pregnancy would pose higher risks for prematurity, low birth weight, sight and hearing deficiencies, underdeveloped lungs and cerebral palsy, among other risks. 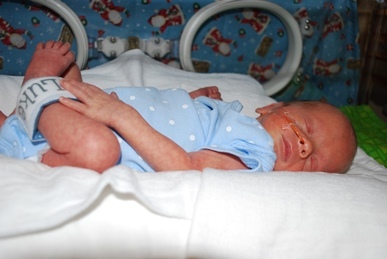 Quintuplets are rare, occurring only once in several million pregnancies. renowned for saving the lives of more than 650 premature infants a year. delivered by a 24-person team in just 17 minutes. Despite their early arrival and sharing the womb, the five babies had better than anticipated weights ranging from three to four pounds. Donate now to support St. Joseph's life-giving, lifesaving mission. Camille, Clara, Luke, Isabelle and Ava kept a low profile for the camera, but behind the scenes the team at St. Joseph's Nursery Intensive Care Unit was working steadily to meet their every need. 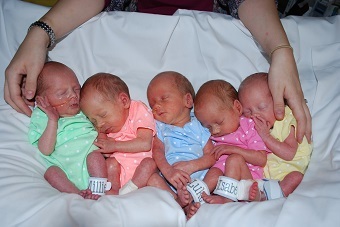 The quintuplets were born three weeks before Christmas, weighing between 3 and 4 pounds. Parents Margaret and Michael relocated temporarily to Phoenix from Virginia purposely to deliver their infants at St. Joseph's.